Anzac Hall. Photo: Australian Institute of Architects. A Canberra architecture community was deeply shocked when news first broke of plans to demolish Anzac Hall. Surely, this was a mistake, as there had been limited consultation with the community and no consultation with the moral rights holders – the architects who designed the award-winning building – nor with the Australian Institute of Architects. Less than a week later, these reports were substantiated with the announcement of close to a half-billion-dollar redevelopment to the War Memorial including the demolition of Anzac Hall. Further, it was revealed that work on these redevelopment plans had been secretly underway since 2015. Surely such a development within the public realm requires large-scale community and stakeholder consultation? This process of conducting planning behind closed doors requires scrutiny. Perhaps this secrecy was connected to the potential for community backlash against the wasteful demolition of an award-winning building 17 years young which holds the memories of Australians who served our nation. It should come as no surprise then that we at the Australian Institute of Architects have voiced such strong opposition to the plans that have finally been made public. While welcoming efforts to further honour the stories of Australia’s servicemen and women, we are at a loss as to why alternatives that allowed for the preservation of Anzac Hall as part of the redevelopment plan were not further explored. And alternatives there were. At a recent meeting with Australian War Memorial Director, Dr Nelson, he confirmed that 18 different options had been put forward for consideration, 17 of which did not involve the demolition of Anzac Hall. This clearly begs the question as to why the one option that involved the demolition of the existing building was the one selected. We struggle to understand how this decision came about, the due process that should have been followed, and ultimately, who agreed to the proposed demolition. 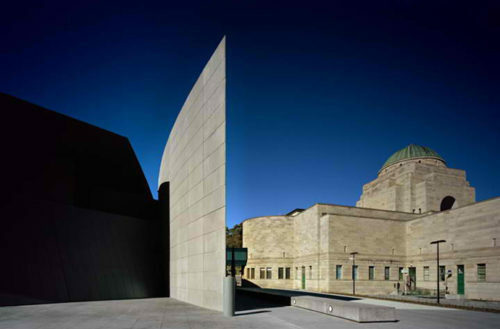 The Australian War Memorial is a place of exceptional national significance. We accept that the institution needs to evolve over time and requires renewal to accommodate new functional requirements. However, needlessly obliterating Anzac Hall, a fit-for-purpose, award-winning, multi-million-dollar building is a colossal waste and mark of disrespect. These sentiments have been echoed across the community. Yet Dr Nelson told media he was ‘unapologetic’. “By the time it goes down,” he said, “we will have had 19 wonderful years out of it”. This is spin of the highest order. Since when have public buildings become so easily disposable? In building terms, Anzac Hall is in its infancy as our public architecture is designed and built to last 50 to 100 years or more. Denton Corker Marshall (DCM) of Melbourne, one of Australia’s most innovative and respected architectural firms, designed Anzac Hall. Having previously designed the Memorial’s office building to the west of the main building, they knew intimately the challenges facing them when they were asked to design the Hall. Their design response was an exceptionally creative one, guided by the Memorial Director and staff, with a thorough and carefully considered conservation management plan, and respected conservation architects. The completed hall, with its great sweeping metal roof, so beautifully evoking the wings of a plane, sits deftly in front of, but not obscuring, the Memorial’s northern façade. A more sensitive design is hard to imagine. The interior is finely crafted, and the grand spatial qualities are seemingly limitless and large enough to suitably display the largest of Australia’s wartime heritage. So impressed was the respected jury of the Australian Institute of Architects’ National Architecture Awards that it awarded the building with its highest national honour, the Sir Zelman Cowen Award for Public Architecture in 2005. Perhaps the real problem is that DCM executed their brief too well. As it stands, the building is (appropriately) understated, and contrasts with the grandiose vision portrayed in the recently unveiled plans. If grandeur and greater volume is what is desired, there are countless examples around Australia and the world of how expansion can be achieved in a way that preserves the integrity of an existing site and its heritage components. We therefore welcome an open public conversation with the Australian War Memorial, the Government, government agencies, community, architects, planners and the media, with respect to the options for redevelopment of the Australian War Memorial that do not involve the unnecessary and wasteful demolition of Anzac Hall. The Australian War Memorial must reflect the wishes of the community in whose heart it holds a special place. Our ‘Hands off Anzac Hall’ campaign has only just begun and we won’t give up until other voices in the debate over the Australian War Memorial’s future are heard. Visit our newly launched campaign website here. Philip Leeson is the ACT Chapter President of the Australian Institute of Architects. Original Article published by Philip Leeson on the RiotACT. It is a sacred place for many Australians. Leave it alone. I agree with the above article, I shocked when I fist heard the news I feel that Dr Nelson, has a very tin ear, the whole building is akin to a cathedral and should be left alone.